This all in one pot Cajun Jambalaya is packed with jumbo size shrimp, chunks of chicken and slices of andouille sausage. Get it on your weeknight family dinner rotation! Cooking dinner in one pot has saved my sanity on more than one occasion, especially after dinner when the dishes need to be done. One-pot means less to clean up and that’s an awesome thing. 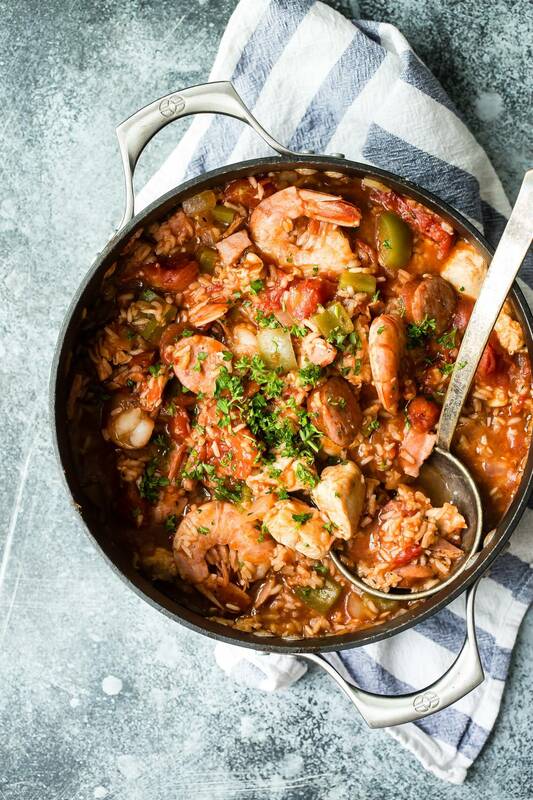 This Cajun jambalaya is loaded with giant shrimp, chunks of chicken and andouille sausage. The whole thing is held together by a thick aromatic tomato sauce. 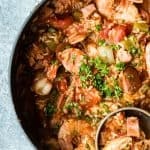 This is an easily adaptable recipe, you could leave out, add or switch up any of the main proteins but I love my jambalaya and gumbo thick and rich. Try and stick with large shrimp, the little ones get lost among everything else. What else is in this Cajun Jambalaya? The sauce is made mainly from tomatoes, chicken stock, peppers, and herbs. Once everything has been added to the pot it’s left to simmer for about 45 minutes. The shrimp are added at the end with only about 10 minutes of cooking time left. They cook very quickly and shouldn’t be overcooked. Rice is also added at the beginning and it slowly cooks as the jambalaya simmers, thickening the sauce and providing a complete meal. 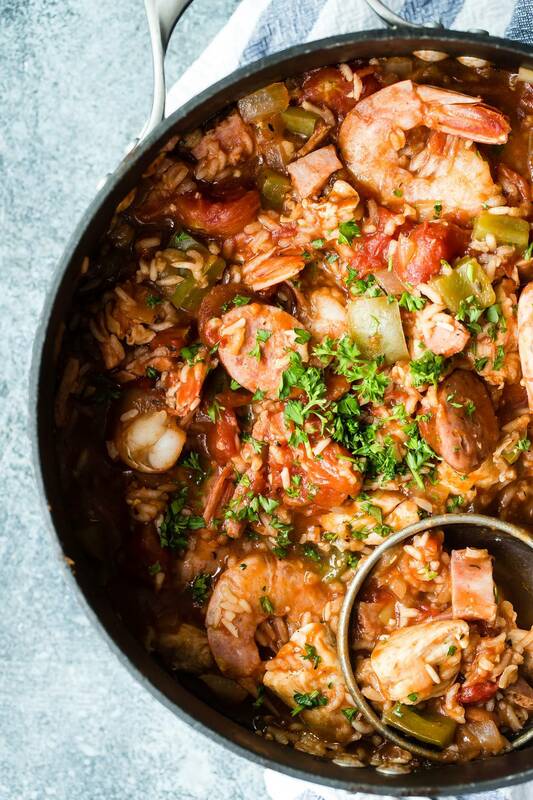 Are jambalaya and gumbo the same? Not really, jambalaya is more like a paella where gumbo is a thick stew made with a roux- melted butter and flour. I think jambalaya is easier because it doesn’t begin with a roux. Both dishes require some love and attention so there’s no quick way to make them. It’s definitely worth spending some time with all creole food recipes. This isn’t spicy at all but if you prefer to give it a kick, you can add 2-3 drops of Tabasco at the beginning of the simmer along with a teaspoon or two of chili powder. I’m a big fan of spicy foods but I usually add my own spice after it’s cooked. 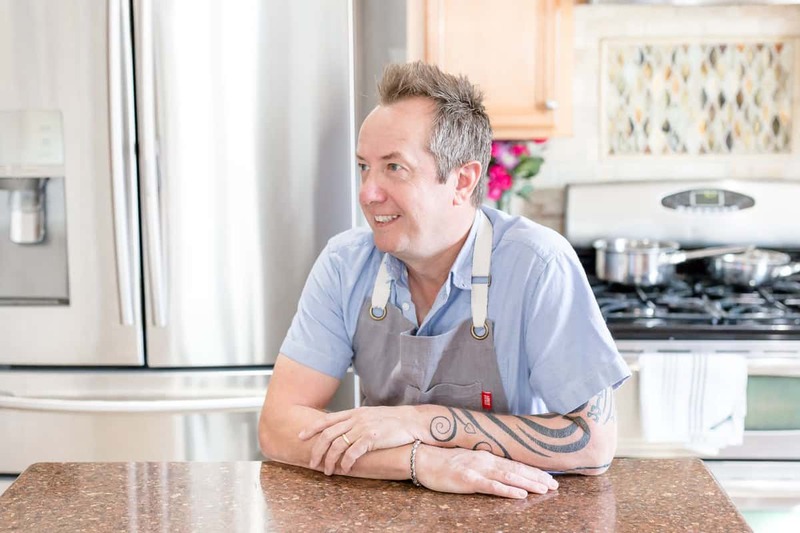 Don’t forget to follow me on Facebook, Instagram, and Pinterest for more awesome recipes! I love to see what everyone is cooking so tag me @foodnessgracious and I’ll always repost to my stories. 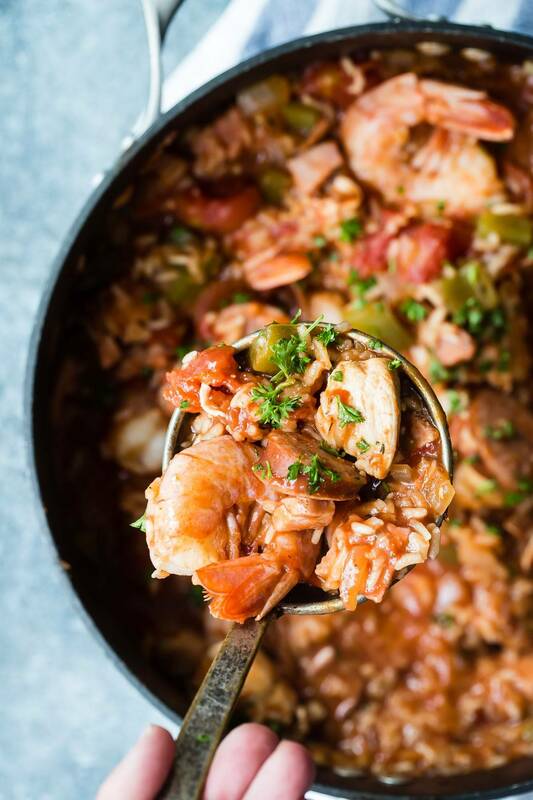 An amazing Cajun jambalaya loaded with chicken, shrimp, and andouille sausage. This is made in one pot and can easily feed six hungry mouths. In a heavy dutch oven or cast iron pot heat the oil. Add the chicken, ham and sausage and cook until seared. Transfer to a plate and drain any fat leftover. Add the onion and cook until soft, about three minutes. Add the garlic and green pepper and stir. Stir in rice, tomatoes, stock, Worcestershire sauce, thyme, bay leaf, salt and pepper. Stir well. Return the cooked meats to the pot and bring to a simmer. Cover the pot and cook in the oven for about 35 minutes, stirring a few times along the way. After 35 minutes, add the shrimp making sure to mix them through the jambalaya. Serve at once in bowls. Chicken, shrimp and andouille sausage. AND it’s a one pot meal. Amazing. Looks delicious! But is it made in the oven or on the stovetop? Hi Abby- sorry, it’s actually started on the stove and then finished in the oven.